For any woman who has despaired because she doesn’t fit the definition of “standard beauty,” Dietland is a must-read. Plum Kettle is a 300-pound woman in her late 20s who dreams of a life in which she is thin and confident. Swearing off parties, clubs, bars, beaches, amusement parks, and airplanes because she’s embarrassed by her weight, Plum rarely leaves her apartment except to go to a local coffee shop where she answers emails to the editor of a teen magazine for a living. The salary isn’t much, but the health insurance will help her reach her true goal: weight-loss surgery. Plum fully expects to live the life she’s been waiting for after the surgery. At the very least she’ll finally be able to wear all the “thin clothes” she has bought online. But Plum’s plans are derailed when she confronts the strange girl who has been following her. At its heart, Dietland has a straight-forward message about the evils of female body objectification in popular media. Don’t expect a sweet, demur story here; this book has a bone to pick, and the plot will surprise you. Check the PPLC Catalog for Dietland. Categories: AnnMarie's Picks, Audiobook, Books, Characters, Contemporary Fiction, Dark humor, Ebook, Plot, Satire, Women's fiction | Permalink. The Crying of Lot 49 was… weird. I read it for a book club I’m running that purposefully aims for off-beat reads, and I was still surprised at the strangeness that packed every page. The book is only about 150 pages but Thomas Pynchon really squeezes the most out of every sentence. There is no filler story which means you shouldn’t read this before bed, because each paragraph changes the plot. Oedipa Maas (what a name) is thrown into a chaotic, conspiracy theory-fueled expedition to carry out a dead ex-boyfriend’s last requests. What starts as a moderately interesting mystery quickly leads to Oedipa questioning the United States Postal Service and talking down her LSD prescribing psychiatrist, Dr. Hilarius. Teenage musicians, failed child stars, play actors, professors of literature, talk radio DJs—Pynchon throws them all in, with each character more interesting than the last. This is the kind of book that you’re suppose to read with a group; when it’s over you’ll need to speak to someone about it. If you like books that make you scratch your head, books that plead with you to read them again, then check out The Crying of Lot 49. The plot is simple; the story is not. Check the PPLC Catalog for The Crying of Lot 49. Categories: Amelia's Picks, Avant Garde, Books, Characters, Classics, Clever dialogue, Contemporary Fiction, Drama, Fast-paced, Humor, Mystery, Plot, Satire, Subculture | Permalink. Lionel Red Dog, Latisha Morningstar, Charlie Looking Bear, Alberta Frank, and Eli Stands Alone are Blackfoot Indians from the city of Blossom in Alberta, Canada. As the Blackfoot Community gathers for the annual Sun Dance, mysterious forces conspire to force all five of these Indians to take part in their cultural heritage. Elsewhere, four other Indians escape from a mental hospital in order to “fix the world”. Woven into this narrative is a completely different story starring the trickster Coyote. This book is not for everyone; it is admittedly weird. There are no chapters, and the point of view changes between characters a lot—sometimes from page to page. However, readers brave enough pick up this book will be deeply satisfied. The story is full of religious and cultural references, but one does not need to understand each reference in order to enjoy the story. There are two different narratives: one set in reality about the Sun Dance, and another structured like a myth set firmly outside anything real. As the novel progresses, King weaves both plots together beautifully. One thing I really enjoyed about this novel is that it relentlessly pokes fun at white people and white culture. Green Grass, Running Water serves as a gentle reminder that my cultural worldview is not universal. Check the PPLC Catalog for Green Grass, Running Water. Categories: Avant Garde, Beth's Picks, Books, Canadian, Characters, Contemporary Fiction, Literary fiction, Magical realism, Plot, Religion/Spirituality, Satire | Permalink. Working retail just got a whole lot scarier. Amy Porter is just one of the many employees working a dead-end retail job at “the all-American furniture superstore in Scandinavian drag, offering well-designed lifestyles at below-Ikea prices.” The store is relatively new, but there are already problems: every morning the opening crew finds malfunctioning electronics, ruined displays, and “messes” smeared on the furniture. When Amy’s annoying boss, Basil, asks her to stay in the store with him overnight to get to the bottom of the disturbances, Amy has no choice but to agree. Soon they discover that this new store has a long history that’s coming back to haunt them. Categories: AnnMarie's Picks, Audiobook, Books, Contemporary Fiction, Fast-paced, Horror, Humor, Paranormal, Quick reads, Satire, Setting | Permalink. Published years before there were 50 of them, Shades of Grey is about as far from erotica as you can get. Author Jasper Fforde is perhaps better known for his Thursday Next series, which established him as an incredible worldbuilder and somewhat of a satirist. In Shades of Grey, Fforde kicks the satire into overdrive in this “colorful” dystopia. Centuries ago, in an event referred to as the “Something That Happened,” Homo sapiens disappeared and were replaced by Homo coloribus, i.e. people that can see shades of only one certain color. That color determines a person’s place in a strictly-controlled hue hierarchy with Purples on the top echelons and Greys on the very bottom. 20-year-old Eddie Russett has strong Red perception and hopes to marry into a wealthy Purple family. His hopes are put in jeopardy, however, the moment he arrives in East Carmine. A tiny village far from the bustling city Eddie is used to, East Carmine is steeped in small-town secrets and societal intrigue. Though Eddie has no desire to disrupt the system, he’s nevertheless drawn into a web of mystery that will make him question everything he knows about himself, his people, and his world. Humorous, poignant, and brilliant, Shades of Grey should not be missed. A sequel, Painting by Numbers, is due out in 2012 in 2014 in 2015 someday, hopefully. Check the PPLC catalog for Shades of Grey. Categories: AnnMarie's Picks, Apocalyptic fiction, Books, British, Characters, Clever dialogue, Contemporary Fiction, Drama, First in a Series, Humor, Mystery, Plot, Satire, Science fiction, Setting | Permalink. The above exchange between the main character of The Wee Free Men, Tiffany Aching, and an overly smug adult is what instantly endeared me to this story. The Wee Free Men is the first book in the Tiffany Aching series, but the 30th book in the overall Discworld series. Before passing away in March of 2015, Pratchett wrote over 40 novels in the series since The Colour of Magic was published in 1983. Discworld was a huge canvas for Pratchett’s brand of whimsy, humor, and satire. We will miss his prolific talent. Tiffany Aching is the descendant of Granny Aching, known in the community for her wisdom and no-nonsense way of cutting straight through to the truth. Though now gone, Tiffany thinks of her grandmother often, compulsively quoting her pithy sayings to the point that Granny is almost an extra character in the story. At the tender age of nine, Tiffany is well on her way to inheriting Granny’s mantle as a wise woman with her sharp mind and the ability to see what’s really there. Categories: Adventure, Books, Characters, Classics, Clever dialogue, Contemporary Fiction, Dave's Picks, Fantasy, Humor, Quick reads, Satire, Setting, Young Adult | Permalink. I first read about Scott McCloud when a favorite comic blog I read daily, Sheldon, recommended Scott McCloud’s Understanding Comics. I thought that if Sheldon believed this book was amazing, I should read it. Understanding Comics is, hands down, the best work on the art, theory, and design behind what makes the comic strip format the compelling narrative form that it is. I heard about The Sculptor being published and was excited to see McCloud’s work, because he is a master at explaining and describing art. David Smith is a sculptor who is down on his luck. His talent, though undeniable, is marred by his uncanny ability to push away those who believe in him. His angry outbursts are a tragic counterpoint to his deep need to create with his hands. Complications arise when he can’t find anyone to a) buy his work, or b) fund his work in progress. The art world with its politics, critics, patrons, gallery shows, and competing artists is used as a backdrop to explore what art is, what it means, and how that is translated to its value in dollars. The Sculptor took McCloud 5 years of ‘hibernation’, as he terms it, to complete. It is at once a love story, a meditation on mortality, and an aria to the creative process. McCloud takes advantage of every visual trick and frame to tell his story and bring new insights to the character and the city around him. The caption photo above is an excellent example of using a sidewalk and calendar to represent not only the passage of time, but the passage of time in a specific way. 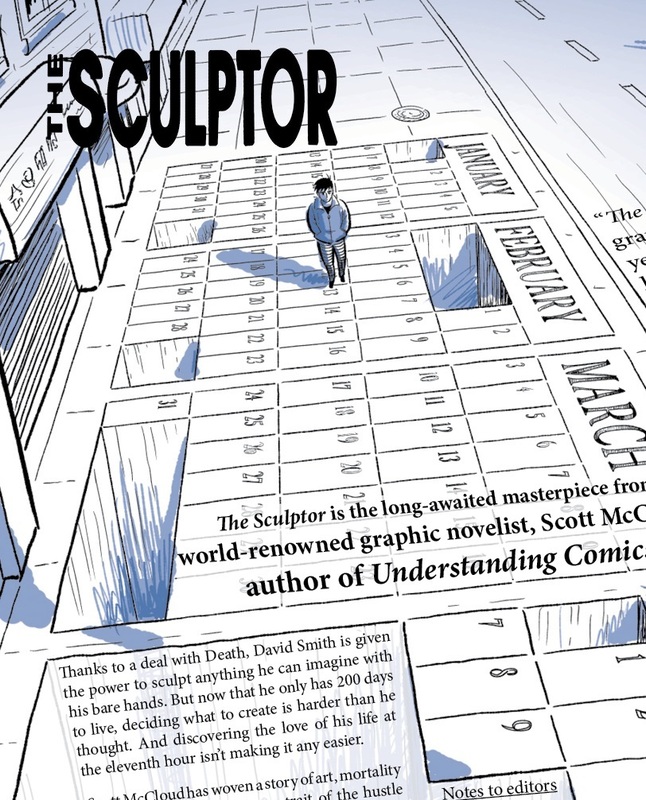 For this virtuoso performance in graphic novels, I recommend Sculptor. Check the PPLC Catalog for The Sculptor. Categories: Books, Characters, Contemporary Fiction, Dave's Picks, Drama, Graphic Novels, Paranormal, Plot, Satire | Permalink.